Check out those street lamps! a. you’ve seen light fixtures that looked like that at all? Tim Burton movies don’t count. b. you’ve seen street lamps created exclusively for a neighborhood? c. you’ve seen this Metropolitain sign? Chances are you have. They have the same story of originality and authenticity, and are associated with only one city in the world, Paris. Not bad for a simple, modest sign don’t you think? This speaks to the power of establishing your own local identity via how many good stories you can tell about what makes your neighborhood one-of-a-kind special. 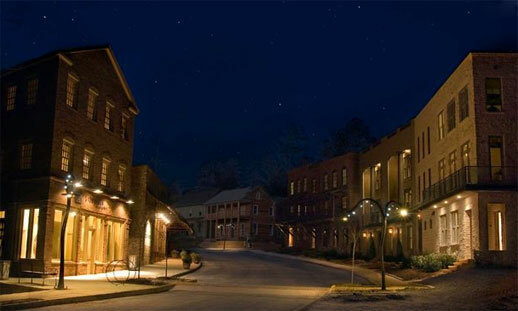 These stories have an even greater impact of progressiveness if it’s something as mundane as an outdoor light fixture, which by the way are located in the Selbourne neighborhood of Serenbe, Georgia. In addition, the street lamps aren’t an isolated thought or happy accident, but a deliberate manifestation of the neighborhood’s profoundly embraced art scene – more on that tomorrow. Sure, happy accidents are ideal, but you can’t count on them, and as they say, “luck happens when preparedness meets opportunity”. Thanks to Erin Caricofe for the reference to Serenbe! Btw, if you watch the video featured on her January ’08 blog entry you’ll never think about ‘stuff’ the same way again.